Cinedigm invites movie fans everywhere to experience DEAR DICTATOR on DVD and Blu-ray on Tuesday, April 24th. Odeya Rush (Lady Bird, The Giver) stars alongside Michael Caine (The Dark Knight, The Prestige) as a young high school student who becomes the pen pal of an infamous dictator. Katie Holmes (Batman Begins, TV’s “Dawson’s Creek”), Seth Green (Austin Powers), and Jason Biggs (American Pie, Amateur Night) also star in this acerbic high school comedy. 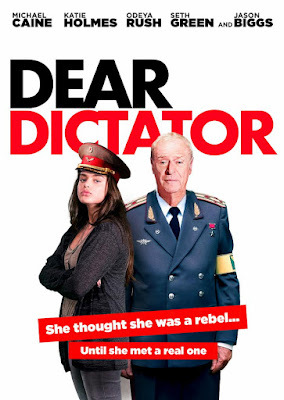 Directed by husband and wife team Joe Syracuse and Lisa Addario (Amateur Night), DEAR DICTATOR is a modern political satire that you’ll be certain to write home about. As Jello Biafra once said, “A good punk rock song will make you laugh, make you think, and make you mad -- hopefully all at the same time.” Directors Joe Syracuse and Lisa Addario certainly feel the same way about making movies. While the idea for the film came 12 years prior, DEAR DICTATOR’s messages about politics and society are just as relevant now as they were then, all in this playful coming-of-age story.